Blake is LOVING Halloween this year. 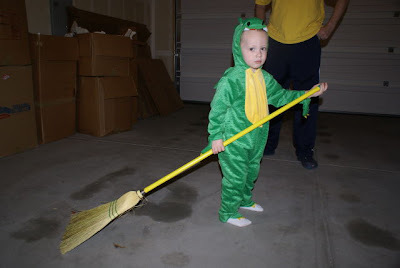 Grandma Wendy sent him a fun dragon costume that has been attached to Blake's body since it arrived. We have had a lot of fun this Halloween and look forward to more fun this weekend. 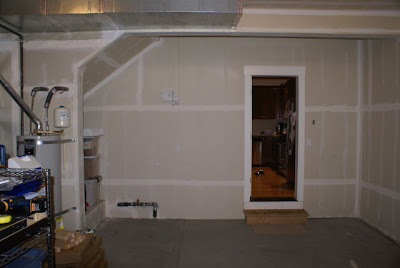 Three projects we have done in our house. 1. Blinds. I am so excited to finally have them up. They look great and I don't feel so exposed. Matt did a great job installing them and I like to believe I was a fabulous assistant. 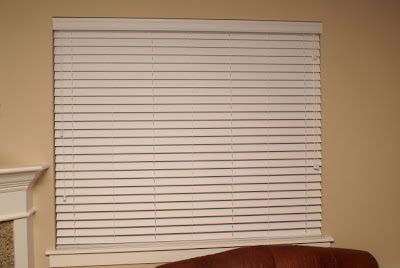 Thanks to our friends for all the recommendations on how and where to buy our blinds. 2. 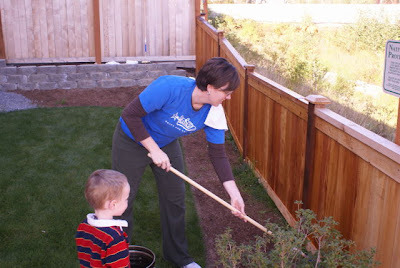 Staining the fence. I was actually kind of excited about doing this one but the fun of the painting wore off after only a few minutes. We still managed to get it done and just in time because we have had rain ever since. 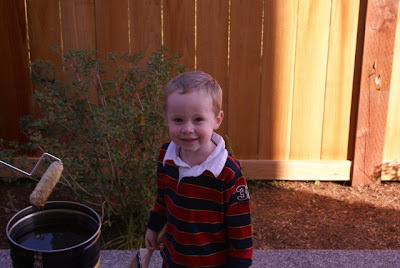 As you can imagine, Blake was a HUGE help with this project. 3. 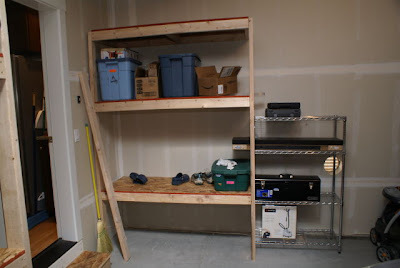 Shelves in the garage. We are slowly working our way to fitting both cars in the garage. Matt worked for two Saturdays with our friend Kevin (who was a big help and who we hope still calls us friends after taking up two of his Saturdays. Thank you so much!). They busted these shelves out and we love them! I am so impressed with the projects! And you look good with a paint brush in your hands. comparing the befores/afters of projects is one of the best things ever! you guys have been busy already! nice work on the pumpkins too! I LOVE your house...from what I could see in the background. So pretty! 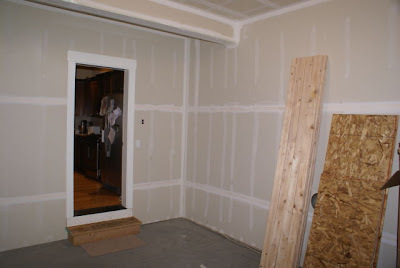 How fun that you have real house projects. It looks great. Two funny things. 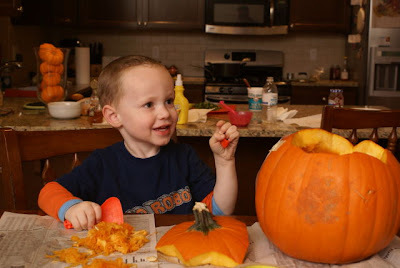 Lincoln is a dragon this year for Halloween too and we carved that same "boo" in our pumpkin! Great minds think alike, right? 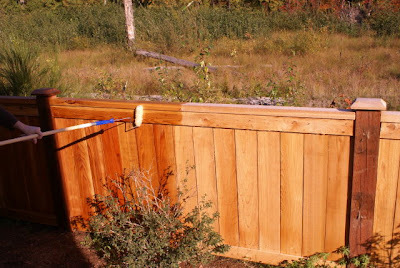 UGH...staining the fence. We can totally relate to that. It was taking us forever to do all of ours that we finally broke down and bought a sprayer!! It looks like you have been busy getting settled into your new house. I had to laugh because we chose the same skeleton template to carve our pumpkin. Your "boo" pumpkin is well done too! i'm still so impressed that you guys have already accomplished so much on your new house. i'm still working on unpacking! way to go guys! very impressive. i think i'm most impressed with the fact that you got the measurements on the blinds right the first try!! that's a feat in and of itself! You guys are busy busy busy. Very impressed Megs!! What good little home owners you are! Way to go "Handy Matty" on the shelves! 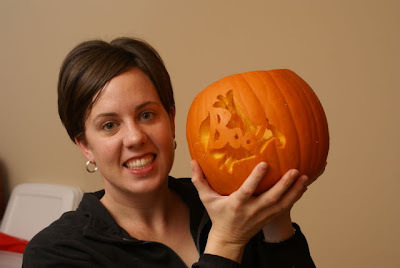 I didn't carve the boo pumpkin, in case you were wondering. 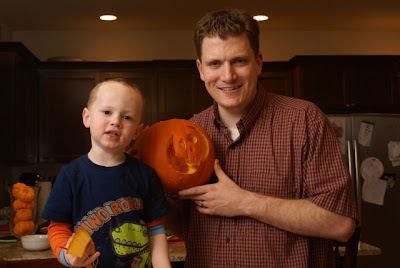 In fact, I didn't carve any pumpkins at all. Hope you had a great Halloween! ah... a real house! so fun! i'm with kim - pumpkins didn't happen this year for us. i love that blake wears his costume everywhere. Nice! Very great progress on the house! Fun pictures. And your house is beautiful!!!! Congratulations on the new home. 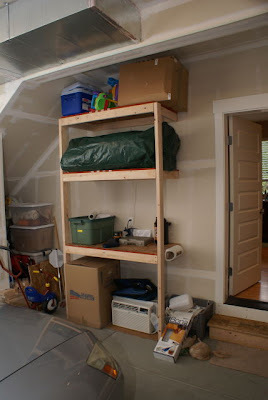 Isn't it so fun to be able to do whatever you want with your home because it is yours? Hope you're having a great Fall! You're on a roll! That Boo pumpkin is so excellent looking too. I like the fence! Wow, I am so behind on blogging! Looks like you guys have been very busy! How is everything else going?